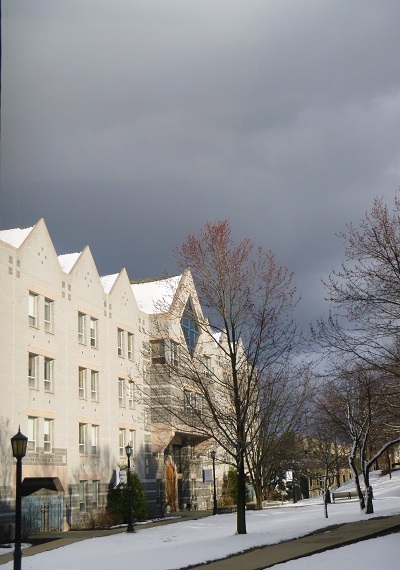 Falvey Memorial Library :: A Nor’easter Is Coming! A nor’easter is coming! We have been hearing or reading this prediction for several days, but exactly what is a nor’easter? A nor’easter (sometimes called a northeaster) is a storm which forms at sea, within 100 miles of the Atlantic coast. It is named for the direction of the powerful winds that bring these storms ashore. Nor’easters are most common from September through April although they also occur at other times. Nor’easters, with winds often reaching hurricane-force, make landfall from New England through the Mid-Atlantic regions. Unlike hurricanes which are named, nor’easters are not. These storms bring frigid temperatures (which we already have – do we really need more? ), powerful winds, coastal flooding and blizzards. (NOAA’s current prediction is heavy snow with 6-12 inches accumulation; msn.com says “blizzard-watch”). Notable nor’easters include the Great Blizzard of 1888 and the “Perfect Storm” of 1991. What will the nor’easter of March 2017 bring? Can we hope for a snow day so soon after Spring Break? For help with Science and Engineering resources, contact Alfred Fry, room 224, telephone 610-519-4283.